"You folks are AWESOME! Thanks for keeping the customer in mind. I wish more companies thought the same way." Our red and blue AN Hose Ends fit nitrile-lined racing hose (stainless braided or Aeroquip Startlite). The swivel lets you "clock" the ends after assembly. Pegasus Auto Racing is your IN-STOCK source for AN stainless steel braided racing hose. Lightweight, flexible hose is compatible with the oils and fuels normally found in race cars. Hyperco High-Performance Chassis Springs, 2 1/4" I.D. Hyperco springs have a long track record of success in nearly all of the upper levels of auto racing. We carry a many sizes in 2.25" ID for coil-over shocks. Setrab oil coolers have a brazed aluminum construction that provides maximum cooling capacity in the smallest possible space, with minimal pressure drop. Girling integral-reservoir Master Cylinders can be used for brake or clutch. These are Brand-New, Genuine Girling units. Only the real thing has GIRLING on the side! The OD of this CV joint is machined to reduce rotating mass. This normally stiffens the joint, but the ball races in our joints are re-honed for smooth operation. 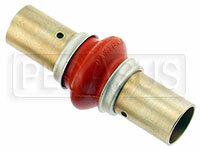 This 25mm to 16mm reducing elbow makes a 90 degree bend while connecting a 1" OD tube to a 5/8" OD pipe in your cooling system. Midnight Black silicone rubber hose has 3-ply reinforcement. Our SCCA-required triangular vinyl TOW decals make it easy for safety and rescue teams to find your tow hook. Choose Up, Down, Left or Right in different colors. These Hawk Brake Pads fit Alcon H-Type / Intermediate Rear and AP Racing CP2361 / CP3228 / CP3735 / CP4556 / CP4558 / CP6030 calipers. Typical applications include F3000, Formula Atlantic, and Rally cars. The Cartek XR Battery Isolator is an FIA-approved solid-state master kill that you mount near the battery. Mount the red trigger switch in any convenient spot. SFI Approved High Density Foam Padding prevents helmeted heads from contacting solid objects. These 1" thick sheets can also be used for rigid seat inserts. This FIA 8853-2016 homologated 6-point 2x2 harness from Sabelt is specifically designed for GT and Endurance racing where the driver is wearing a HANS Device. The Facet 40138 Cube Style 12 Volt Fuel Pump has a 4-7 maximum psi, and a maximum fuel delivery of 32 gallons per hour. 1/8 NPT female ports, and built-in check valve ensure flow in one direction. The Tilton OT-II Single Disc Racing Clutch has a 7 1/4" disc for long life. The Orange spring handles 280 lb-ft of torque, enough for FF, FC, or Sports 2000. This 2 quart Accusump precision-machined cylinder protects your engine from temporary oil pressure loss. The low-cut Piloti Spyder S1 is an updated version of the popular Spyder SV. It retains the patented Roll Control heel and heel-and-toe sole reinforcement. Our ultra-precise digital tire pressure gauge features factory-certified calibration to 0.5% accuracy, verified on start-up by a self-check program which alerts you if it ever needs recalibration! This AiM Wheel Speed Proximity Sensor (AKA Car or Phonic) is triggered by a toothed wheel or the heads of your wheel studs passing close by. No magnet required. Nearly 1,000 different part numbers are now in stock from 1/2 inch to 6 inch inside diameter. Available in black, blue or red. Save on our durable, heat-resistant, high-quality Silicone Hose. Great for coolant or turbo intake plumbing. Beta Tools began manufacturing professional-grade tools in Italy in 1939. Now in their third generation of family ownership, Beta Tools are manufactured in 3 Italian factories. Partnerships with leading Formula 1 and MotoGP teams keep Beta Tools in touch with the needs of professional racing mechanics. Why run heavy battery cables all the way from your battery to your kill switch and back? The Cartek GT Battery Isolator is a solid-state electrical master switch that can be mounted close to the battery. It is triggered by a push button switch which can be remote-mounted in the location specified by the rules. Pegasus now stocks Jabroc Skid Plate Material in 7 thicknesses ranging from 4mm (0.16 inch) to 25mm (0.98 inch). Standard sheet sizes are 50cm x 50cm (approx. 19.5 inches square) and 50cm x 100cm (approx. 19.5 x 39 inches). Jabroc's predictable friction and wear properties make it an ideal skid plate material. Jabroc also has many industrial uses. It's half as strong as steel but only one fifth the weight! Machines easily, is non-sparking and non-conductive. All of the HANS Devices we stock carry both SFI 38.1 certification and FIA 8858 homologation (some other sellers charge extra for the FIA label). Order today for FREE FedEx or UPS Ground Service to the 48 contiguous states! These strong yet compact, military specification joints are often used in shift linkages. They are permanently lubricated and protected with a silicone rubber boot. Manufactured to Military Specification MS-20271. All 8 sizes currently in stock ranging from 0.25 to 1.25 inch bore. Our airframe bolts are manufactured from heat treated and cadmium plated Type 4037 alloy steel. They conform to military specifications and every lot must pass stringent testing at every step of the manufacturing process. AN bolts have excellent toughness and impact resistance. When subjected to a destructive force, they will bend before breaking - often avoiding a catastrophic failure. A Grade 8 SAE bolt may have a higher ultimate strength. However, the Grade 8 bolt often fails without warning by having the head pop off. We now stock nearly 800 different sizes of AN bolts. However, if you're looking for a size we don't carry, let us know. We'll try to get it for you. Bob is the most recent winner in our $5,000 sweepstakes. Every time you place an order you'll be entered. No purchase necessary. Export orders make up a significant portion of our sales. Because of our high volume of international shipments, we have been able to negotiate very competitive rates for expedited shipping to foreign destinations. In addition to our large warehouse, we also have a small showroom and customer service counter. If you're in the area, feel free to stop by! Click the above photo for a behind the scenes look at our warehouse expansion project.